EPPING, N.H. – The Nocella Paving 100 at the 53rd annual Star Classic at Star Speedway in Epping, NH was an event that will be remembered for quite some time. 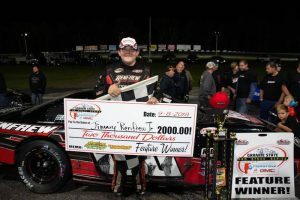 Fifteen years young from Candia, NH local favorite Jimmy Renfrew Jr won his first pro stock race at his beloved home track. The ride into victory lane wasn’t without peril though, as on lap 30, Renfrew took a ride deep into the turn two woods and had to be assisted back to the racing surface by speedway services. Soon after taking the checkered flag, Renfrew drove into victory lane and was swamped immediately by family, friends, and loyal fans. Current points leader Cory Casagrande of Stafford Springs, CT finished fourth. Casagrande has an average finishing position this season of fifth place, an impressive feat never finishing worse then 8th after 8 events. Grinding out a top five finish Ray Christian III of Groton, CT had a night that went round and round. Leading laps, battling in the top five, the #93ct got caught up in an altercation which put Christian further back in the field pushing back the teams hopes of their first pro stock victory to yet another day. Christian will have that opportunity at the next race this coming Saturday, September 15th at Monadnock Speedway in Winchester NH. For more information please visit www.gspss.net and follow our social media channels Facebook, Twitter, and YouTube.